Well I've seen Christopher Nolan's WWII triptych twice now. The first time I had very mixed feelings about it. Dunkirk is essentially without characters. It's a visceral, small-scope assault on the senses designed to plunge the viewer into the horrors of this particular battle (if one can even call it that), wherein 300,000 British soldiers were rescued from certain death after being trapped on the beach for days. So shallow was the water at Dunkirk that British destroyers were unable to access the besieged soldiers, and thus the Navy began recruiting small private vessels which could navigate directly to the beach. The evacuation was considered miraculous and inspired Churchill's famous "We shall fight on the beaches" speech. But the film left me a little cold on the first viewing. While I was duly impressed with Nolan's technique (as always) and the film's authenticity, I wasn't able to connect with any of the characters since they're only there to drive the plot. Dunkirk boasts precious little dialogue, and what's there is often hard to make out amid the thunder of battle and Hans Zimmer's pounding score. I exited the theater saying to myself, "Okay....so that happened. Now what do I do with it?" Upon a second watch I was able to put aside my expectations (Nolan films usually have a rich emotional core to them but Dunkirk's lack thereof frustrated me), and simply take the film for what it was and what it intended to do. Nolan wants us to see, hear and feel what it must've been like, how harrowing the experience was, how terrifying for the British not to know whether they'd ever make it off the beach. The historical context and the personal drama didn't concern him; he preferred to tell this story through visuals and sound. 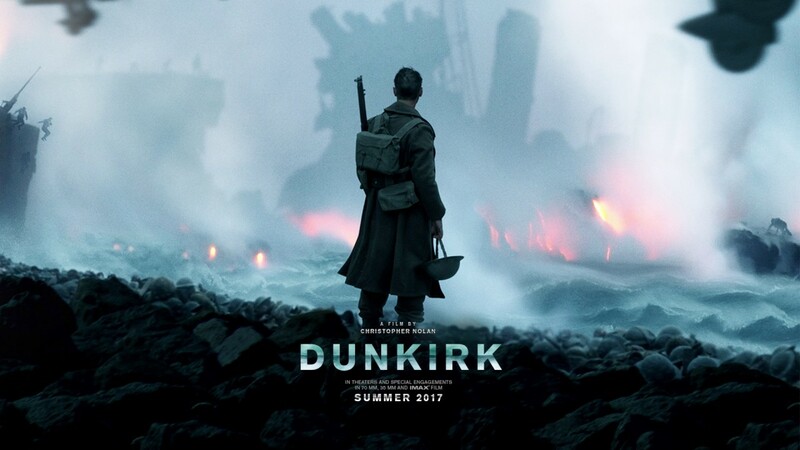 To set Dunkirk apart from other war films, Nolan employed a threefold narrative structure and used time expansion to allow intercutting between the three segments (The events on land cover one week, the sea one day, and the air one hour). On the first viewing I found this a little distracting and gimmicky, but the second time it worked for me, keeping the film's momentum fluid and lending the two shorter time periods more weight than they would've otherwise carried. For a 2017 film, Dunkirk has a very no-nonsense frankness about it. There is nothing glamorous about the battle scenes, no rousing speeches to the men, no Hollywood sheen to the events. The film is visually striking but not in a trumped-up, artificial sense. The sequences in the air for example don't play out like Top Gun; the pilots don't pull any fancy spinning maneuvers or spectacular midair stunts. They use simple flight patterns to position themselves with a direct line of sight to enemy planes. When planes get shot down they don't explode like a TIE fighter. They emit smoke and slowly lose altitude before crashing to the water below. The main character Tommy (Fionn Whitehead) and the other trapped soldiers spend much of the film hiding, crawling and trying not to drown. The Mark Rylance character and his two shipmates spend the film just trying to reach Dunkirk while there are still soldiers to rescue. There's nothing gratuitously adventurous about these characters, they were simply terrified young men whose only concern at this point was escaping to England. Contrary to the usual war movie fare, there's nothing fun about what we see here. I've read reviews calling Dunkirk the best war film ever made and others calling it Nolan's greatest work. I disagree with both statements, but this is still a very worthy entry in Nolan's catalog. He's looked at the war genre from a different angle and presented an immersive, austere look at what these soldiers went through in the aftermath of one battle. You won't find any philosophizing about the brutality of war, nor much context to drive home the implications of this evacuation, beyond the obvious, that it saved hundreds of thousands. What you will get is a thoroughly realistic, gritty visual document achieved with thousands of film extras, real World War II vehicles and equipment, talented actors (who admittedly aren't asked to do all that much acting), and almost no CGI. Dunkirk may not be a masterpiece, but it's a film you'll find yourself thinking and talking about long after you've seen it. I give the film *** out of ****.